“Offal” (an unfortunate name) basically refers to the edible parts of an animal aside from the muscle meat that we typically eat. It includes organ meat (liver, kidneys, heart, etc) and other unusual cuts of meat – tongue, cheek, bones, etc. Organ meats are the most concentrated source of pretty well every nutrient, including those vitamins and minerals that people with autoimmune disease and other chronic diseases are lacking. Most of us have associations with organ meat. I really like liver. I remember enjoying liver and onions as a kid. Tongue, on the other hand was a meal that I loathed. 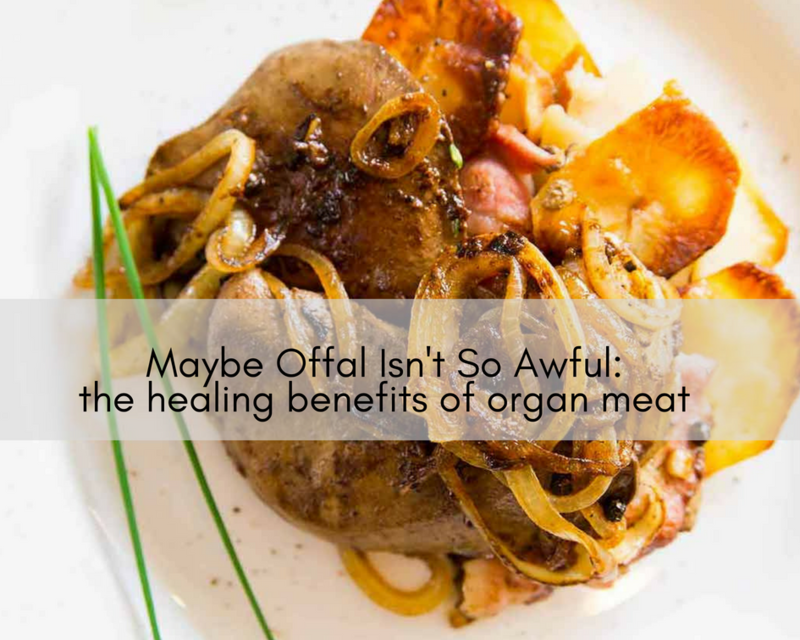 Despite any preconceived notions about offal, the density of nutrients and healing potential of including them in your diet is worth considering. Roughly 20% of the edible part of a cow is offal. Including these cuts in your diet is not only good for you, it also makes good ecological sense. The standard North American diet doesn’t pay much attention to organ meats, and most people have an aversion to even the idea of consuming it. It is too bad really, because the nutrient density of these foods is hard to beat. Incorporating offal into your weekly menu planning will seem difficult at first. You may get some push-back from the kids, however try to soldier on. The benefits are great. Remember that if you are trying to heal your body, these are some of the most healing foods that you can eat. Aim for a variety of organ meats in the week, and ideally aim for four meals a week minimum. It sounds like a lot, but with a little experimentation, you will start to find favorites! Even starting with two meals a week is a good plan, but try to work up the frequency. Eating organ meat is a good way to address any micronutrient deficiencies you may have, and these deficiencies tend to stand in the way of optimal health. Pates, stews, pan frying and simple grilling are possible ways to enjoy offal. If you are really averse to plating up a piece of liver, or a serving of kidneys, try grinding the organ meat and adding it to ground beef or lamb. It hides very well in meatballs, meatloaf or burgers! Another option is to cook the organ meat and cut it into very small pieces, freeze it and consume it like a pill with water. The importance of including offal in specialized ways of eating like the Autoimmune Protocol can’t be understated. Consuming these meats will do great things for your health, so regardless of your preconceived notions about these foods, it is worth getting over it. Then scoot all of that to the side of your skillet and sear the liver slices on each side (for about one minute). Once the meat is seared on both sides, pile the onions, mushrooms and bacon on top of the liver, turn the heat down to medium and let the meat cook through for 5-10 minutes. This will ensure a nice caramelized sear on the meat, as well as making sure it all cooks through. Heat 2 tbsp duck fat in a large skillet on medium, and once hot, cook liver with 1/2 tsp salt for 3-4 minutes per side until no longer pink in the middle, then remove from the skillet and chop into small bits. Pulse the rutabaga in a food processor until it resembles rice, then peel and dice carrot, slice green onion in slivers, and mince the fresh ginger. Heat remaining duck fat on medium-low heat in the skillet, and once hot, add ginger and carrots, seasoning with 1/2 tsp sea salt and allowing to cook 2-3 minutes until semi- soft and fragrant, then add in riced rutabaga and parsley. Turn the heat to low, pour in 1/4 cup bone broth, 1/2 tsp salt, and stir quickly to fully in- corporate, then immediately cover the pan, allowing the mixture to cook for 10 minutes. After 10 minutes, remove the cover and add remaining 1/4 cup bone broth, green onion, and chopped liver, covering one last time and allowing to cook for 6 minutes, then serve.